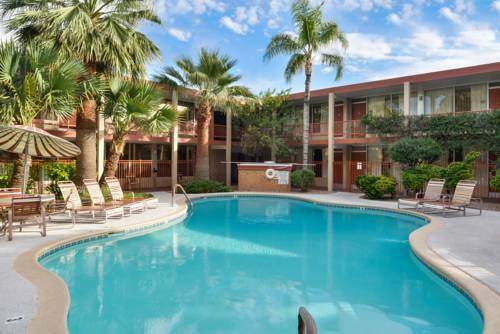 Stay at the charming Magnuson Hotel Papago, a 100 percent smoke free hotel, located in Scottsdale, Arizona, near the Phoenix Zoo and downtown Scottsdale. This hotel places you within 5 miles of many popular attractions including the Sun Devil Stadium, Desert Botanical Garden, and historic Old Town Scottsdale. Arizona State University and Tempe Diablo Stadium are less than 10 miles from the Magnuson Hotel Papago. Before exploring all that the Scottsdale area has to offer, guests can start each day with a free breakfast, stay connected with free wifi, and relax by the outdoor pool, or get in a work out at the exercise room. Guests will also enjoy relaxing with friends at the hotel's cocktail lounge. All 58 guest rooms are tastefully decorated, and have views of the flower filled courtyard, aviary area, pool area, waterfall and Gazebo. First class amenities included in each room include a 32 inch flat screen color TV with over 75 cable channels, mini fridge, free high speed wireless internet access, coffee and tea maker.